Audi RS5 Performance, Engine, Ride, Handling | What Car? It might have an Audi badge glued onto it, but the RS5’s V6 is shared with the Porsche Panamera 4S. In normal use it’s a smooth and refined engine that fades into the background unless the optional sports exhaust is in Dynamic (read noisy) mode. Flick the switch to turn up the volume of the exhaust and you’ll find it howls and parps when you’re on it, but it does then drone at speed. 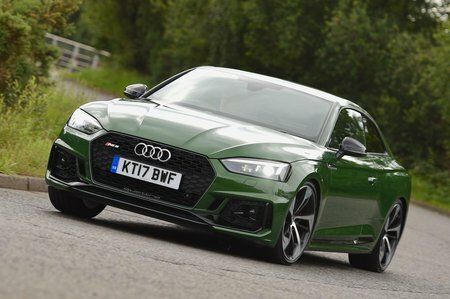 Thanks to being turbocharged, the new car feels much more urgent low down in the rev range when compared with the old V8-powered RS5. Even so, it’s worth revving the V6 harder for more performance. There’s no doubt that the quattro four-wheel drive slingshots you off the line, making the 3.9sec 0-62mph time seem entirely believable. Once off the line, it never feels quite as quick as an Alfa Romeo Giulia Quadrifoglio, BMW M4 Competition Pack or the AMG C63 but you’ll still be in licence-losing territory in no time at all. The automatic gearbox certainly helps thanks to eight well-chosen ratios. It operates smoothly when you’re driving sensibly and is pretty obedient when you take control manually. Unfortunately, it’s not quite as snappy to shift as the dual-clutch gearboxes in rivals. 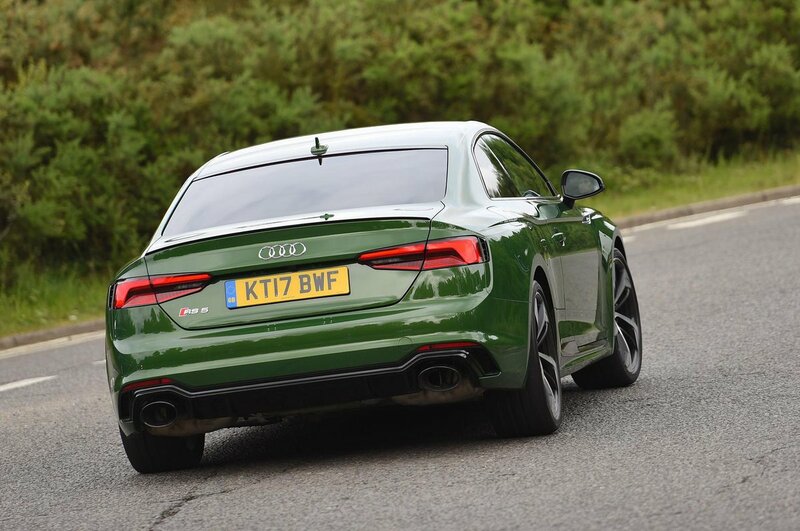 So far, we’ve only tried the RS5 with the optional Dynamic Ride Control adaptive dampers and optional 20in wheels. With the suspension set to comfort, the ride is largely comfortable, save for the odd moment over very rough surfaces and some body float over crests. Even so, it’s still very comfortable given that this is a high performance coupé. Auto mode tightens things up without damaging comfort while Dynamic firms things up further. This mode is really suited to the smoothest of roads or a track, though. Enter a series of corners and you’ll find that it’s easy to place the front of the car, even with the optional Dynamic Steering that can vary how many turns of the wheel you need to get from lock to lock. While the system certainly helps you get around tight turns easily, it also removes any sense of connection with the front wheels so you can’t feel what they’re doing. To be honest, the standard steering isn’t much better - a M4, C 63 and Giulia Quadrifoglio all steer with more purpose. You’re also always aware of the RS5’s mass, too; it may be lighter than before but you still feel some hesitation when changing direction quickly due to the its not insubstantial weight. In the dry, the traction you get out of corners is virtually unbeatable. No matter how hard you push, the RS5 never feels like it’s going to get too out of shape. Some may find this reassuring as it does make the RS5 a very easy car to go quickly in. On the other hand, we do miss the sense of adjustability and downright hooliganism offered by the rear-wheel-drive Guilia, M4 and C63.